On the15th April 1733, William Fell married Mary Fletcher. We don't know whether the service was held in Bainton or Ufford, nor do we know who attended his wedding. But we do know he was a mason by trade and it would seem likely that he'd been busy throughout the previous year building a house for himself and his new wife to live in. 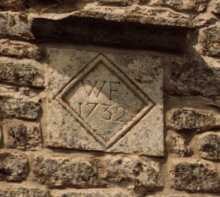 Here you can see the datestone he carved and placed high on the gable end. Above it, the chimney rises from the huge inglenook fireplace. We don't know how old William was but he was probably in his mid twenties when he married Mary. This would mean that he was born in about 1708, just 42 years after the great fire of London and just one generation away from the dreadful plague that attacked London. I wonder if that plague reached these parts and if it ever cropped up in conversations in Ashton at that time? It is impossible to know exactly what happened over the following years because William and Mary are long gone, as are their children and their children's children. They didn't leave us diaries or letters and we don't even know if they could read and write, though it seems likely that they could. However, like all of us they left a trail of their lives in official documents and from it we've been able to work out fairly accurately who lived in the cottage throughout its history. The trail may be 283 years old (in 2015) but it includes the datestone, the enclosures awards map of 1799, old deeds, parish records, gravestones in Ufford churchyard and a will. So we know with a fair amount of certainty that William and Mary Fell had a daughter, Elizabeth, who was baptised on 8th October 1734. Tragically, she seems to have died only two days later so the cottage must have known great sadness in its first year of occupation. Then on 3rd February 1735, a son William was baptised. He lived for 59 years and inherited the cottage when his father died. He was buried on 14th February 1780. We think that WIlliam and Mary also had another child - a daughter, Mary, who was baptised on 31st May 1739 - but that she too, died in infancy just six months later and was buried on 6 September 1739. If all this is true then it seems the cottage wasn't full of laughing children during those early years, just young William growing up with his father and mother. This is a guess based on the records we found which also contain other members of the Fell family. So we like to think that the house was a happy place with a growing family. We know of no other events over the next twenty years. The family probably lived as contentedly as anyone else in Ashton. William was probably building other local houses or working on buildings in Stamford. And we know they owned strips of land scattered across the four great fields of the parish because when they were enclosed in 1799 the paddock opposite Berry Cottage was awarded to Mary Fell (see Enclosure for more). Then, in January 1761, young William's mother, Mary, died. She was buried on 28 January. It must have been a tragedy for both of the men, especially since young William was due to marry a local girl called Mary Nottingham just a couple of months later. She lived in Bainton and despite the loss of his mother, she and William were married on 14th April 1761.